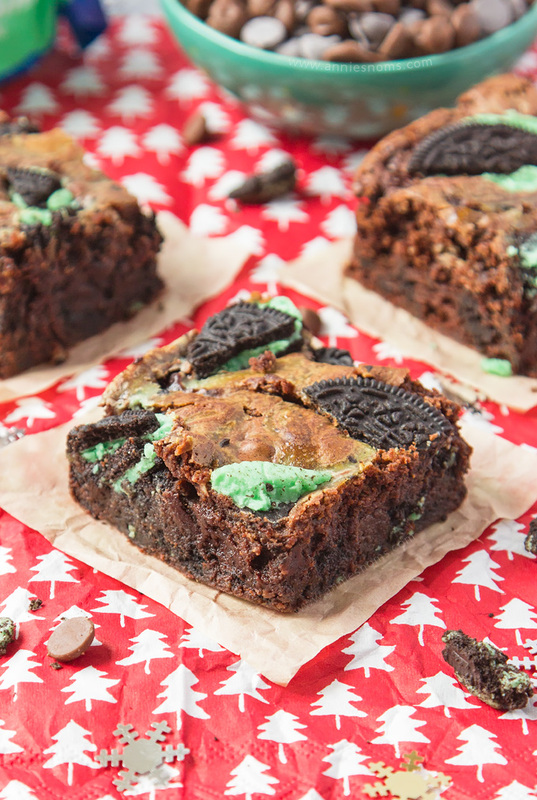 Thick, fudgy double chocolate brownies filled with crushed Mint Oreo’s. A super decadent festive treat the whole family will love! Happy December!! Who can believe it’s just 24 more sleeps until Christmas?! Today we are talking Oreo’s and brownies. OMG. I FINALLY found Mint Oreo’s in the UK! This is literally life changing. I was so excited to try one I almost ripped open the packet before we left the shop. I’ve wanted to try these babies for years. And let me tell you; they do not disappoint! Refreshing, sweet and minty, I just knew I had to crush some up and make my ultra famous, gooey, fudgy brownies for this festive season! Now, I know there are lots of different opinions on brownies and how they should be made; with cocoa, with chocolate or with both. Me? I’m firmly in the “both” camp. I use a 1/4 cup of cocoa powder and 100g/3.5oz of good quality dark chocolate. This is because I want rich and fudgy brownies. Generally in baking, if you take out some flour and add cocoa in its place, it dries things out. There’s obviously a balance that can be made and you can totally get some great bakes with just cocoa powder, but a brownie, to me, should be pure decadence. So I ensure that my brownies will be 100% soft and fudgy by adding both cocoa powder and melted dark chocolate. Any time I’ve tried a brownie with just cocoa powder and someone claims them to be the “best ever” I’ve been disappointed. If you’ve found the magic key to a rich and fudgy cocoa powder only brownie then let me know and I’ll give them a go! 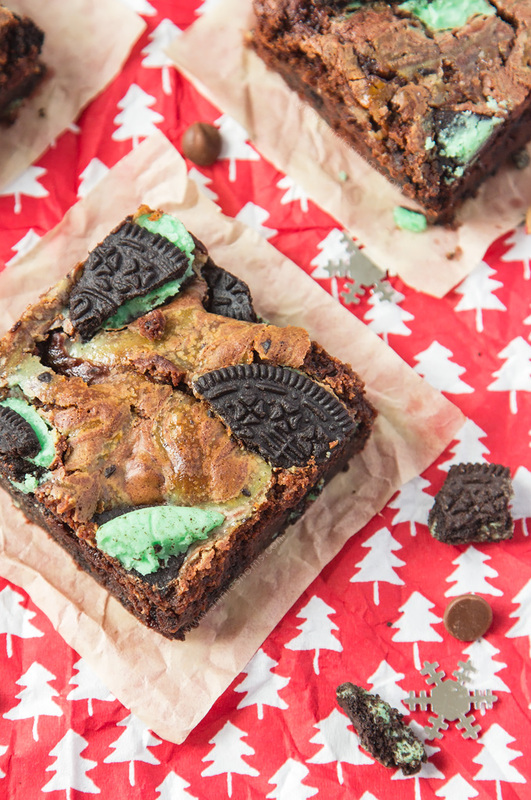 Anyway, back to today’s Mint Oreo brownies! I’ve always been jealous of all of the amazing variations of Oreo’s there are in the US, (I’m still dying to try Pumpkin Spice and Gingerbread) so when I manage to find a cool flavour in this country I feel like dancing. There’s a full 1 and 3/4 cups of crushed Mint Oreo’s in these brownies and then I broke up 4 more to press into the top of the brownies. And then I may or may not have eaten 5. They are somewhat more-ish. I’m an Oreo addict at the best of times, so add in some mint and I’m all over them. Once baked these brownies are so tempting it’s unbelievable. I could not resist getting a spoon and digging into a corner approximately 2.5 seconds after they came out of the oven. And once they were cool? My skinny jeans hated me. Every bite is pure bliss. 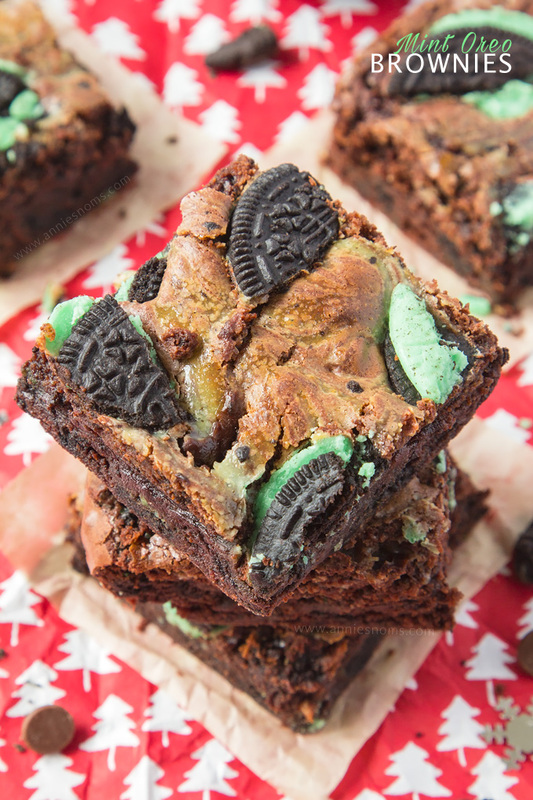 Soft and crunchy, the Oreo’s give a great contrast to the chewy brownies and the mint adds a refreshing note to these squares of heaven. Now, these are RICH. So in theory, that means you only need a small serving, but who am I kidding, I still want to eat 3 squares in quick succession. Since it’s officially December, I am almost exploding with excitement thinking of all the festive treats I want to make! Gingerbread Popcorn is coming your way on Thursday and this weekend, I’m feeling some Eggnog. Last year was the first year I tried Eggnog and it was delicious, so I’m definitely making some again! 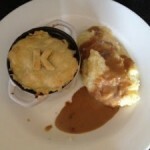 Since we are teetotal in this house it’s best to make my own as I know 100% it doesn’t have alcohol in. Eggnog isn’t popular over here, I’ve only seen it once in a supermarket, but still I have to be careful about the rum. What would you like to see me make with Eggnog? I’m thinking muffins at the moment. Maybe with some cranberries? 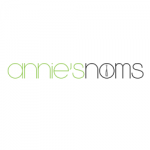 Drop me a note below and let me know what you want to see on the blog next week! Have a great Tuesday! 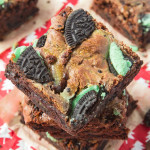 Thick, fudgy double chocolate brownies filled with crushed Mint Oreo's. A super decadent festive treat the whole family will love! Break up the chocolate roughly and place in a heatproof bowl with the butter. Microwave in 20 second increments, stirring in between each, until all the chocolate is melted. Stir for at least 20 seconds as the chocolate will continue to melt. Alternatively, place the heatproof bowl on top of a saucepan of simmering water and stir until melted. Leave to one side to cool. Place sugar, eggs, vanilla and peppermint extracts into a large bowl and whisk until well combined, smooth and slightly bubbly. Place flour, cocoa powder, baking powder, salt and crushed Oreo's into a medium sized bowl and stir until all of the Oreo's are coated in flour. Pour the slightly cooled melted chocolate mixture into the egg and sugar mix and whisk until thick and smooth. Tip the flour and Oreo mixture into the chocolate mixture and switch to a wooden spoon/spatula to gently fold in the flour mixture. Mix until you can't see any lumps of flour, but don't beat. Tip the mixture into your lined pan and smooth until level with the back of a spoon/spatula. 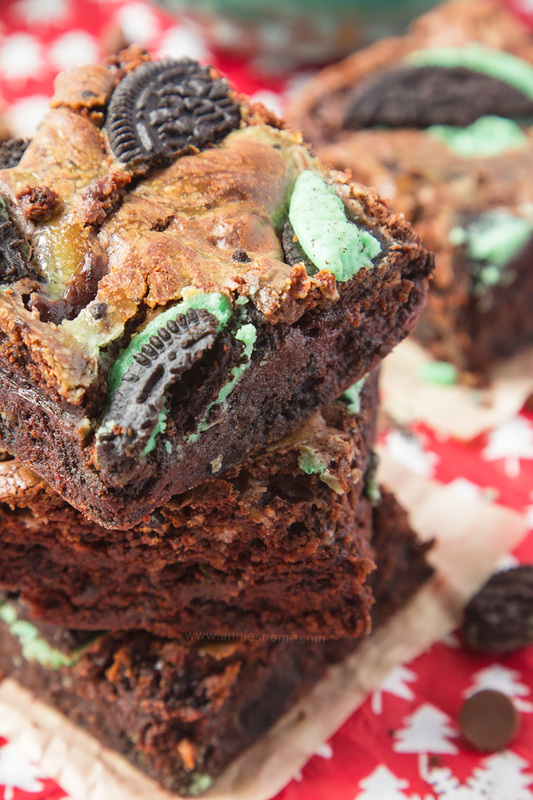 Break up the 4 extra Mint Oreo's by hand and sprinkle on top of the brownie mix. Press into the mixture lightly. Place in the oven for 32-35 minutes until risen and puffy looking, the top will also be lighter in colour than it was when you put it in. If you stick a skewer into the edges it will come out clean, but if you put it into the centre, there should be a few crumbs on it, this is perfect. If the skewer is clean in the centre the brownies are over done. 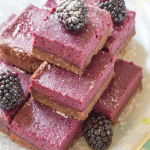 Leave to cool in the pan completely, before transferring to a cutting board to slice into 9-12 bars. 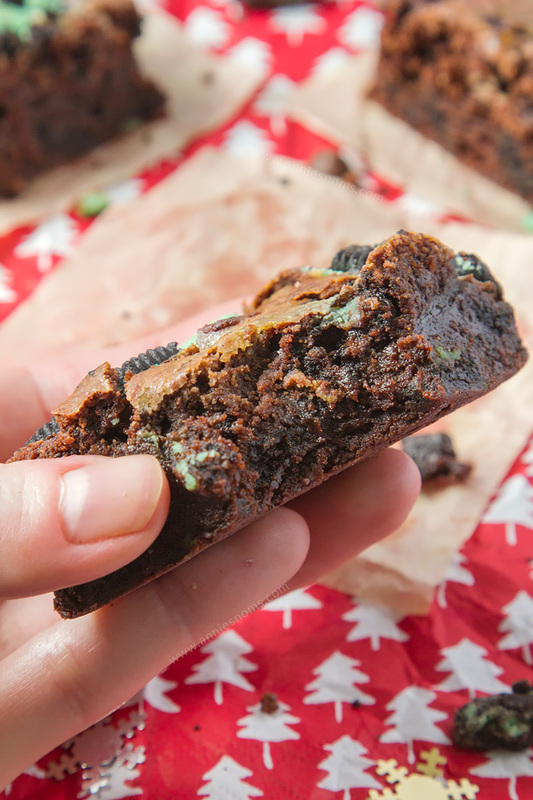 Mint Oreo Brownies will keep in an airtight container, at room temperature for 5 days. Oh my word! Is it difficult to find Mint Oreos in the UK?! I will never take that for granted again! Well these look absolutely delicious. I love how the edges are slightly crusted (I like that extra crunch!). Really difficult! I don’t think we actually get them here, so it’s only companies which import American food. I managed to find them in a supermarket which has a little section for American goodies! I know how you feel – there are so many American treats I wish I could just grab from the local store! But mint Oreos, finally! These brownies look so fudgey, chewy, and delicious! Thanks so much Marsha! The struggle is real! There are so many things I wish we got here! I love new ways of incorporating mint flavor into a brownie. It’s hard! 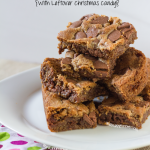 I can’t wait to make these beauties for the holidays! Oh my yummy! I need to make these! I am right there with you, I am Oreo lover! Pair it with brownies and I am completely sold! Thanks so much Megan! I would eat Oreo’s every day if I could!! Wow. These look over-the-top delicious! The perfect holiday treat! A thousand times YUM, I’ll take the whole batch! These look so tempting…they would not last long in this house! Need to add these to my holiday baking list!